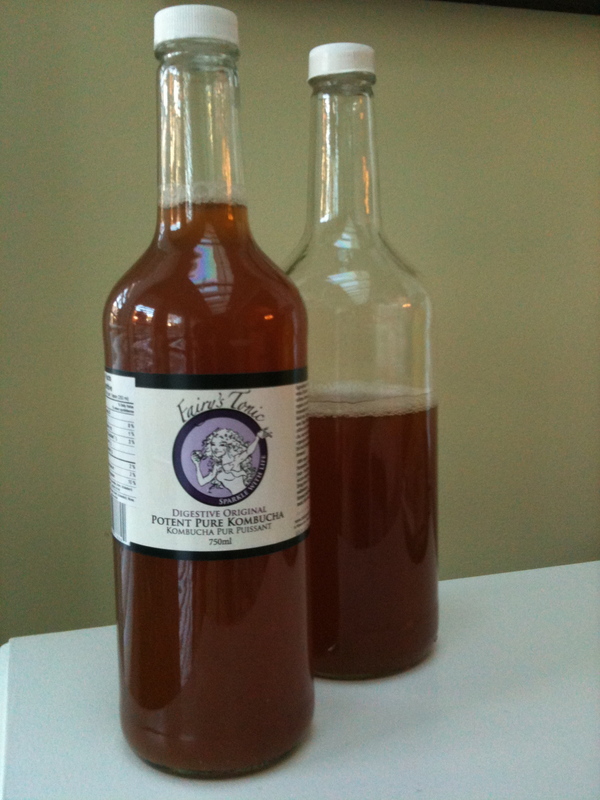 Kombucha, a fermented tea drink, is touted as enlivening, refreshing, and full of health benefits. This tonic is made from simple ingredients and lovingly brewed to offer better digestion, B vitamins, and immune boosting enzymes. Zoey Shamai of The Fairy’s Tonic, graciously invited me to visit her processing facility to learn more about the mysteries of Kombucha and tell me about how her small business is taking off. While living at an ashram in New Mexico, Zoey was introduced to the “clean energy” and feelings of vitalityoffered by the bubbly treat. Everyone was doing it, and would share the bacterial cultures with one another freely. It didn’t take her long to get the hang of it, and upon returning to Toronto, advocated and facilitated the brewing of Kombucha at Live, a raw oriented restaurant where she worked. She insisted on having it on the menu as it was such a hit in the South West. With several brands commercially available in the United States, especially in California, she had a hunch that starting a business manufacturing small batches in Toronto would be worth her while. This seed has grown into quite a viable business and Zoey has chosen to roll with it full time, giving up her position at Live and teaching yoga. Despite some challenges in distribution, The Fairy’s Tonic is quickly being picked up across the city and across the country, making it more readily accessible for the masses. I was shown a photograph of an entire fridge display at a Whole Foods in BC devoted to the multiple flavours and sizes available. It’s huge for a small operation like The Fairy’s Tonic to be listed in bigger chain stores and reinforces the demand for the products. As more and more people are becoming aware of how Kombucha aids in digestion and offers antioxidants, B vitamins and probiotics, they are seeking out the good stuff. Other commercially available Kombuchas are often pasteurized, causing the drink to lose many of its “living” qualities that make it so great. The Fairy’s Tonic prepares its products with organic green or black teas, organic evaporated cane sugar, purified water, and a culture that continues to renew itself by making babies that can be used for the next batch. It is so simple, you wonder why there isn’t a gallon jar of it brewing in every kitchen. The downside is that it has to ferment for 15-21 days, and patience is paramount. When the baby separates from the mother, that’s when you know it’s ready to enjoy.